1 Thessalonians 4:13-14 But I would not have you to be ignorant, brethren, concerning them which are asleep, that ye sorrow not, even as others which have no hope. For if we believe that Jesus died and rose again, even so them also which sleep in Jesus will God bring with him. There is an old saw that goes "there are only two things sure in life: death and taxes. Face it, death is all around us. Every day we either read about it, hear about it on the news, or less frequently, we are touched by it personally. It is generally at those times when someone close to us has died that sorrow grips us. And yet, if we mind scripture, we see that the death of another Christian is not a cause for great sorrow. Not that it is wrong to mourn the loss of a loved one. I would liken it to having a family member move to a different state; far away but much more beautiful, with a better climate, and with a really good job waiting for them. Sure there is sadness involved, but is it sadness for them? No, of course not. They are far better off where they have gone. So why are you so sad? Easy, you are feeling sorry for yourself, because you no longer have their company. Is it wrong to be sad about your loss? Certainly not. And so it is with the death of a Christian. If you yourself are a Christian, then there has to be a goodly amount of joy mixed in with the mourning. After all, the one you are mourning is with the Lord, and the thought of that is so wonderful as to defy description! But, as the above scripture states, there is another group in sight; others which have no hope. Those others are the ones who do not have Jesus Christ as their Lord and Saviour. Indeed, they have good reason to sorrow. Not only for themselves, but also for their loved ones who sleep, but not in Jesus. This past weekend I attended the best funeral I have ever been to. Now that's something you won't often hear! But it is true, nonetheless. About 7 months ago my brother Bill found out he had stomach cancer. To make a long story short, he passed away last week, but not before he and his wife Carol had shown themselves to be splendid examples of faithful Christians. Bill was completely upbeat and praising God right to the end; but of course "the end" was only the end of his pain and suffering. It might be more accurate to say right up to the beginning, for as the Bible tells us, to be absent from the body is to be present with the Lord. Knowing that his time was limited, Bill and Carol, together with their Pastor and Carol's brother (also a Pastor) planned the memorial service in advance. They wanted it to primarily be a Gospel message; something that would bring glory to God's name ....and I believe they were successful. One of the highlights was the reading of Bill's written statement about faith The whole service was down right inspiring. Of course there were some tears, but for many of us, they were tears of joy. The first step is to make sure that you really need a new tire. Humor. 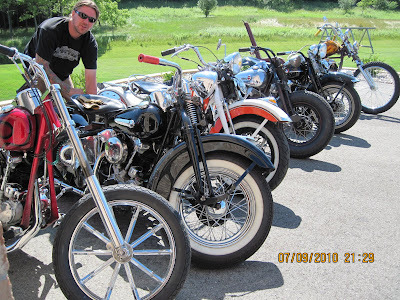 Last year, attending the Knucklehead Reunion was one of the goals I set, but I failed to get "The Knuckledragger" finished in time. In fact, it may not even have been named yet. But with the announcement that Pete Hill would be appearing at this year's event, there was little doubt that I would have to make time to be there. The fact that I have the drag bike running (though as yet un-tuned and untested) only helped seal the deal. The adventure began with Kevin Baas (instructor of the Kennedy High School Chopper Class) talking me into riding out with a group on vintage bikes. This necessitated installation of a new rear tire on Jane's '47, which in turn necessitated a little time in the burn out pit with the old tire. I have it on video, but so far Google's "Blogger" program has not co-operated with my attempts to post it. Fast forward to Friday morning. We left Teach's house in Lakeville Minnesota nearly a half hour past the projected 7am start because Krazy Karl got stuck in traffic. The plan called for us to be to Menomonie Wisconsin by 9am sharp to leave with a larger group who were meeting there. Suddenly our leisurely ride on 63+ year old Knuckleheads turned into a 75mph blast down the freeway with Jane in our Jeep, trailering the Knuckledragger, in close pursuit. Behind her were Karl and Jason pulling a trailer with three more Knuckleheads inside. The next glitch occurred just across the Wisconsin border. Sure enough the newest part on Jane's '47 (a V-Twin replica rocker clutch pedal) broke in half. Luckily the part hit my foot and I was able to trap it on the footboard so that we wouldn't have to stop short of the Menomonie exit. This did, however end my ride to Milwaukee, putting the '47 into the trailer alongside The Knuckledragger. From Menomonie we followed the now larger group of Knuckles (plus a Flattie and a Pan) on backroads to Black River Falls to meet up with an even larger group of antique Harley riders. The remainder of the trip to the Milwaukee area was uneventful. Once we were close, the group split up for their separate destinations. Kevin had already contacted his good friend Mario, to confirm that he had a rocker clutch that I could borrow to put Jane's bike back on the road. Mario and his wife Pat were unbelievably gracious hosts, and soon convinced us to spend the night at their home rather than looking for a motel as per our original plan. It turned out to be simpler to repair the broken weld on the clutch pedal than to change out the whole unit. Mario supplied the welder, Kevin supplied the welding expertise and before you know it, the '47 was roadworthy again. A quick tour of Pat and Mario's house left me a bit dazzled, leading me to ask him if perhaps he is the King of Wisconsin. Mario didn't admit to it, but on the other hand he didn't exactly deny it either. The breakfast that his wife Pat prepared the next morning confirmed my suspicions, because it is obvious that Mario also eats like a King. The night was rounded out by a trip downtown to the "shed." The shed is a building in a warehouse district where a group of like minded guys each rent a space where they work on their hot rod and/or motorcycle projects. A neat concept, to be sure, and a good way to compensate for lack of garage space at your home. Mario had arranged a bit of a reception there so that Kevin, Jason, Krazy Karl (by now joined by Krazy Konnie) Jane and I could meet his friends. By the time we arrived at the Harley Museum on Saturday morning, Pete Hill's supercharged Top Fuel Knucklehead dragbike was already set up on display. I felt really honored to set up the Knuckledragger in close proximity to Pete and Jackie's bike. 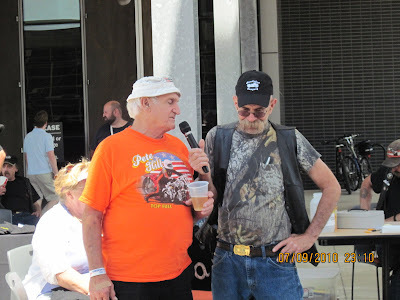 John Endrezzi of the Knucklehead Company (hosts of this great event) did a nice job of interviewing Pete in front of the crowd. 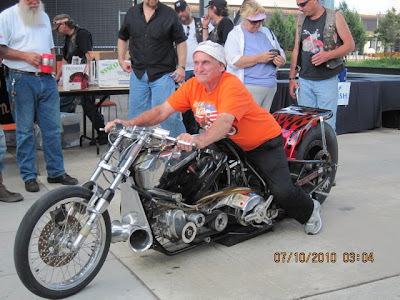 One of the stories Pete related was about the very first "Harley Homecoming" AMRA drag race at nearby Great Lakes Dragaway in Union Grove in 1988. Pete blew a tire at speed during the first day of time trials, sending he and his bike sliding on its side at an estimated 140mph. With no serious injury, he and Jackie managed to get the bike back in shape overnight and went on to win the event. Jane and I were there racing at that event (flying the #1 plate in Pro Stock on our Knuckle drag bike by the way) so I remembered the incident well, but had forgotten that Pete had come back to win the event. A little later in the day, Jane and I got the chance to spend a little time visiting with Pete and Jackie. We came prepared, with some photos for Pete to autograph. They say that behind every successful man is a good woman, and its no different for Pete Hill. I feel confident(and I am sure Pete would agree), that without Jackie Hill, there never would have been a "Pete Hill -Drag Racing Legend." 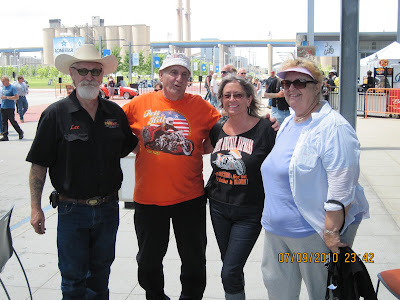 Field games were held in the afternoon, plus most of the participants in the show also found time to tour the Harley Davidson Museum. Just before the show wound down, members of the Knucklehead Company were kind enough to invite me to start the Knuckledragger for the crowd. To be honest, this was more pressure than an actual drag race. 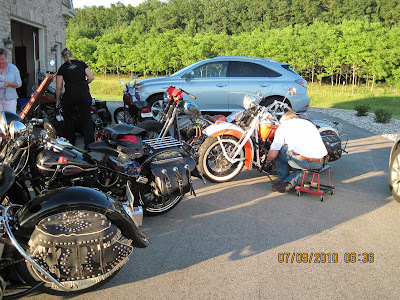 By the time we got the roller starter unloaded and the bike fueled up, we had the entire crowd gathered around to witness the results of my handiwork. If there weren't a hundred people in the crowd, it sure seemed like there were. It certainly was a prime opportunity for me to make a fool of myself if the Knuckledragger decided to play a trick on me by not firing up. But, I survived with my pride intact. The bike started with an impressive roar, and I avoided doing anything stupid. 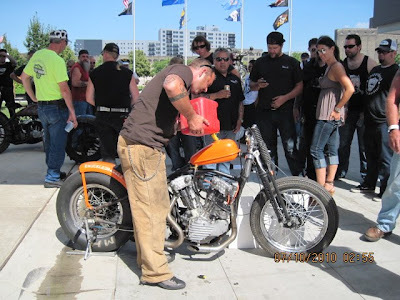 Rather than doing a crowd pleasing tire smoking burnout, and thereby running the risk of wearing out the welcome that the Harley Museum has given the Knucklehead Company for this event, I tried to make up for it with a lot of noise. One lap around the show, clutch in, and revving the engine just a few hundred rpm past where a sane person would take it, seemed like the best compromise. Besides, I already had enough excess adrenaline pumping without doing a stress test on the notoriously bad vintage springer front brake. Overall, a great time was had by everyone. A special thanks the the Knucklehead Company for hosting this great event. And if you own one of these fine '36 to '47 motorcycles, you owe it to yourself to bring it to next year's Knucklehead Reunion!